The unicycling end is still being sorted. Insurance assurance is the current project. You definitely want to be in Butler for the weekend of July 17-18. Come sooner to if you like. The snow should be melted by then. Thanks Isaac for the Photos. Ben now doesn't feel so left out. He is no longer the only one at the table who can't ride a unicycle. By the end of our YMCA time yesterday he had gone from never sitting on a uni to riding 1/2 way across the gym. The first Butler County Stage Race is on! 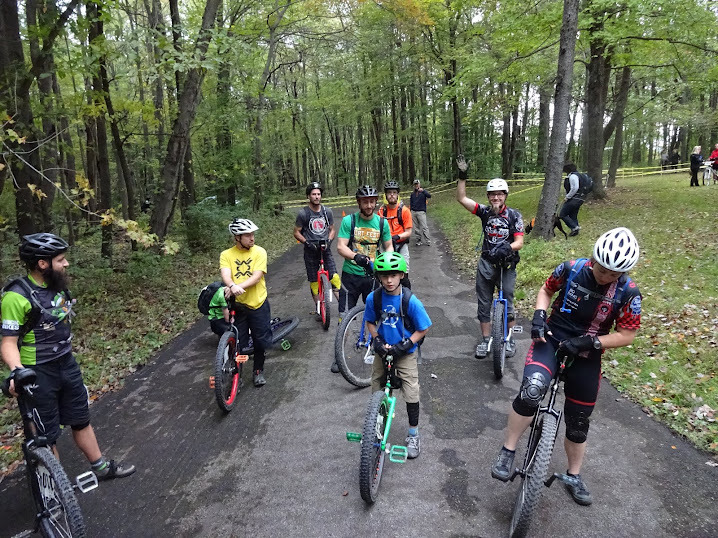 This is the first (hopefully annual) unicycle stage race in Western Pennsylvania (USA). Saturday, July 17th: City Parks Time Trial. A 6.6 mile (approximately) closed course featuring the parks of Butler. In addition to the regular smooth flat paved roads the course includes some hills, brick streets, and pockmarked pavement. Also on the 17th: Main Street Criterium. This closed course includes a flat brick road section and a lollipop loop around the courthouse area. The bicycle course is around 1 mile per lap which is too long for unicycling- especially for those using less than a 36 inch wheel. We're finalizing a good balanced unicycling course. We also have a local skatepark (which is getting some uni trials obstacles this spring!) and a lot of good muni riding for those who haven't yet had enough riding. Racing classifications are being finalized as are costs and many many other details. Definitely all unicyclists are welcomed in Saturday's events. For the Renfrew Rás Road Race a virtual wheel size of 28 inches or greater is recommended as is a brake. The hills around here are rideable without, but they are steep. The Butler County Stage Race weekend is being put on in conjunction with an elite amateur bicycling event (Cats 1-5). We'll not only have the benefit of well constructed courses with ample markings, marshalling, and all of the amenities that go with an elite cycling event- We will be able to be ambassadors to the general public and bicycling public as well. Last year the 1-day Renfrew Rás drew 100 bicyclists, this year 200+ are predicted. We're hoping to make this the premier east coast (USA) unicycle weekend. We're working on keeping costs down and the fun up. This will be a weekend for racers and non-racers alike. We've already got a lot of local support outside of the cycling community for events to fill out the weekend's schedule. I realize that NAUCC is slated for this weekend this year as well. We're not trying to compete- this is the weekend that was available locally. If you're not headed to San Francisco, you should check out Butler. [URL="http://www.butlerwobble.blogspot.com"]http://www.butlerwobble.blogspot.com[/URL] will have more details as they develop. You can also email me at dave(dot)bikes(at)yahoo(dot)com. (Replace the dots and at with the appropriate symbols). The YMCA is OPEN TODAY!!! The weather this past week hasn't been entirely suitable for one wheeled transport. In spite of that fact it is rumored that Andy was out and about on his 26" Nimbus. Way to go! I wish we had some pics. Since the YMCA is open, we're on for today. Come join the fun. To the best of our knowledge he was the only one who didn't get the message about the YMCA being closed for the day. Forunately he ran several blocks through the 2 feet of snow sporting some stylish shorts. Pictures of the ride should make it to the photo album soon. We just found out that today, February 6, 2010, the YMCA is closed due to the weather. The snow is up to the hub on a muni! Even though the weather's lousy we're still on for tomorrow. Butler YMCA, 4:30-6:30. One is more fun. Even though some consider this a holiday weekend, we'll still be riding. As a matter of fact, maybe a bit more than usual: S6 details . Remember: Wobble Saturday, Superbowl Sunday.